The turkey (Meleagris gallapavo) was inarguably domesticated in the North American continent, but its specific origins are somewhat problematic. Archaeological specimens of wild turkey have been found in North America that date to the Pleistocene, and turkeys were emblematic of many indigenous groups in North America as seen at sites such as the Mississippian capital of Etowah (Itaba) in Georgia. But the earliest signs of domesticated turkeys found to date appear in Maya sites such as Cobá beginning about 100 BCE–100 CE. All modern turkeys are descended from M. gallapavo, the wild turkey having been exported from the Americas to Europe during the 16th century. The wild turkey (M. gallopavo) is indigenous to much of the eastern and southwestern US, northern Mexico, and southeastern Canada. Six subspecies are recognized by biologists: eastern (Meleagris gallopavo silvestris), Florida (M. g. osceola), Rio Grande (M.g. intermedia), Merriam's (M.g. merriami), Gould's (M.g. mexicana), and southern Mexican (M.g. gallopavo). The differences among them are primarily the habitat in which the turkey is found, but there are minor differences in body size and plumage coloration. The ocellated turkey (Agriocharis ocellata or Meleagris ocellata) is considerably different in size and coloration and thought by some researchers to be a completely separate species. The ocellated turkey has iridescent bronze, green, and blue body feathers, deep red legs, and bright blue heads and necks covered with large orange and red nodules. It is native to the Yucatán peninsula of Mexico and into northern Belize and Guatemala—in a completely different range than wild turkeys—and is today often found wandering in Maya ruins such as Tikal. The ocellated turkey is more resistant to domestication but was among the turkeys kept in pens by the Aztecs as described by the Spanish. Before the Spanish arrived, both wild and ocellated turkeys were brought into co-existence in the Maya region by the extensive trade network. Turkeys were used by precolumbian North American societies for a number of things: meat and eggs for food, and feathers for decorative objects and clothing. The hollow long bones of turkeys were also adapted for use as musical instruments and bone tools. Hunting wild turkeys could furnish these things as well as domesticated ones, and scholars are attempting to pinpoint the domestication period as when the "nice to have" became "need to have." At the time of the Spanish colonization, there were domesticated turkeys both in Mexico among the Aztecs, and in the Ancestral Pueblo Societies (Anasazi) of the southwestern United States. Evidence suggests that the turkeys from the U.S. southwest were imported from Mexico about 300 CE, and perhaps re-domesticated in the southwest about 1100 CE when turkey husbandry intensified. 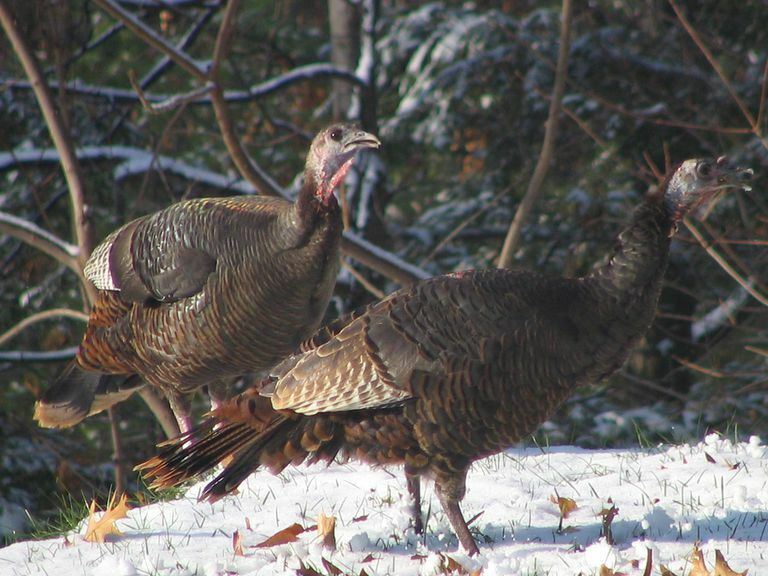 Wild turkeys were found by the European colonists throughout the eastern woodlands. Variations in coloration were noted in the 16th century, and many turkeys were brought back to Europe for their plumage and meat. Archaeological evidence for turkey domestication accepted by scholars includes the presence of turkeys outside of their original habitats, evidence for the construction of pens, and whole turkey burials. Studies of the bones of turkeys found in archaeological sites can also provide evidence. The demography of a turkey bone assemblage, whether the bones include old, juvenile, male, and female turkeys and in what proportion, is key to understanding what a turkey flock might have looked like. Turkey bones with healed long bone fractures and the presence of quantities of eggshell also indicate that turkeys were kept at a site, rather than hunted and consumed. Chemical analyses have been added to the traditional methods of study: stable isotope analysis of both turkey and human bones from a site can assist in identifying the diets of both. Patterned calcium absorption in eggshell has been used to identify when the broken shell came from hatched birds or from raw egg consumption. Turkey Pens: What Does Domestication Mean? Pens to keep turkeys have been identified at Ancestral Pueblo Society Basketmaker sites in Utah, such as Cedar Mesa, an archaeological site which was occupied between 100 BCE and 200 CE (Cooper and colleagues 2016). Such evidence has been used in the past to implicate the domestication of the animals—certainly, such evidence has been used to identify larger mammals such as horses and reindeer. Turkey coprolites indicate that the turkeys at Cedar Mesa were fed maize, but there are few if any cut marks on turkey skeletal material and turkey bones are often found as complete animals. A recent study (Lipe and colleagues 2016) looked at multiple strands of evidence for tending, care, and diet of birds in the US southwest. Their evidence suggests that although a mutual relationship was begun as early as Basketmaker II (about 1 CE), the birds were likely used solely for feathers and not fully domesticated. It wasn't until the Pueblo II period (ca. 1050–1280 CE) that turkeys became an important food source. A possible explanation for the presence of turkeys in Basketmaker sites is the long-distance trade system, that captive turkeys were kept within their original habitats in Mesoamerican communities for feathers and may have been traded up into the United States southwest and Mexican northwest, as has been identified for macaws, albeit much later. It is also possible that the Basketmakers decided to keep wild turkeys for their feathers independent of whatever was going on in Mesoamerica. As with many other animal and plant species, domesticating the turkey was a long, drawn-out process, beginning very gradually. Full domestication might have been completed in the US southwest/Mexican northwest only after turkeys became a food source, rather than simply a feather source. Cooper, C., et al. "Short-Term Variability of Human Diet at Basketmaker Ii Turkey Pen Ruins, Utah: Insights from Bulk and Single Amino Acid Isotope Analysis of Ha." Journal of Archaeological Science: Reports 5 (2016): 10-18. Print. Lipe, William D., et al. "Cultural and Genetic Contexts for Early Turkey Domestication in the Northern Southwest." American Antiquity 81.1 (2016): 97-113. Print. Sharpe, Ashley E., et al. "Earliest Isotopic Evidence in the Maya Region for Animal Management and Long-Distance Trade at the Site of Ceibal, Guatemala." Proceedings of the National Academy of Sciences 115.14 (2018): 3605-10. Print. Speller, Camilla F., et al. "Ancient Mitochondrial DNA Analysis Reveals Complexity of Indigenous North American Turkey Domestication." Proceedings of the National Academy of Sciences 107.7 (2010): 2807-12. Print. Thornton, Erin, Kitty F. Emery, and Camilla Speller. "Ancient Maya Turkey Husbandry: Testing Theories through Stable Isotope Analysis." Journal of Archaeological Science: Reports 10 (2016): 584-95. Print. Thornton, Erin Kennedy. "Introduction to the Special Issue - Turkey Husbandry and Domestication: Recent Scientific Advances." Journal of Archaeological Science: Reports 10 (2016): 514-19. Print. Thornton, Erin Kennedy, and Kitty F. Emery. "The Uncertain Origins of Mesoamerican Turkey Domestication." Journal of Archaeological Method and Theory 24.2 (2015): 328-51. Print.